According to a recent survey conducted by recruitment SaaS company CareerBuilder, 40% of employees plan on shifting jobs in 2018, putting pressure on employers who want to retain their top performers. Also, 86% of the most qualified applicants are already employed and not actively seeking for a new job so recruiters are in a tight spot to develop new strategies in finding and attracting suitable replacements. As a recruiter, bridging the communication gap between you and highly-qualified applicants is an important goal. And text message marketing is an effective method you can utilize to achieve this. To help you ensure you are effectively communicating with candidates via SMS, we will walk you through four rules in professional text messaging etiquette. 1. 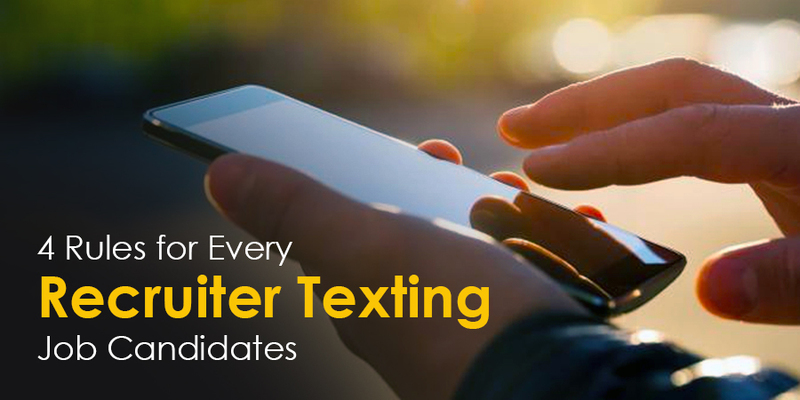 Make sure candidates are comfortable with texting. Although texting is a fast and convenient method of communication for recruitment, not every candidate will be comfortable with receiving text messages from a recruiter. Some may find these messages too invasive or urgent, while others may simply prefer another form of communication, such as a telephone call or email. Before starting the recruitment process, ask each candidate how they would like to communicate with the recruiter. Be sure to ask specifically whether the candidate feels comfortable with receiving text messages. Regardless of their answer, ask the candidate to identify their preferred method of communication. To ensure all text messages are well-received, send them only during business hours and maintain professionalism at all times. Texting is not appropriate for every type of communication that must take place between a recruiter and an applicant. You should not use text messages to communicate sensitive information, such as a rejection. Texting should not be used to make job offers either. In addition, mass texting should not be used for communications that are not directly related to the recruitment process. When crafting text messages, recruiters should always ask themselves whether the message they are sending is necessary and professional. Do not send messages earlier than one hour before the start of a standard workday or two hours after the end of an office day. 3. Use texting for clear and direct communication only. Because texting does not involve body language or voice inflection, miscommunications are common. For this reason, you should avoid using texting to send any type of message that could be considered ambiguous or confusing. Use texting for clear communication only, such as confirming an interview, thanking a candidate after an interview, acknowledging that the candidate has submitted certain documents or answering basic questions from a candidate. All text messages should be kept as short and concise as possible. 4. Use technology to keep texting organized. 89% of job seekers say their mobile device is an important tool for job searching and 45% use it to search for jobs at least once a day, making texting the best way to communicate with them. However, texting multiple recruiters can be overwhelming. If a recruiter does not organize their text messages, they run the risk of accidentally sending messages to the wrong recipients, failing to reply to messages in a timely manner or forgetting to send important information to applicants. Fortunately, a number of programs exist to help recruiters manage text messages effectively. These text message marketing programs offer a wide variety of benefits, such as the ability to send mass text messages to large groups of people, send customized messages to smaller numbers of recipients, ensure that no incoming messages are missed, and keep track of all conversations. Some programs also provide read receipts options so you can ensure your candidates read your messages. Due to the overwhelming amount of different tools that exist today, it is important for recruiters to identify the appropriate tool that meets their requirements. Texting can provide many advantages for recruiters who want to simplify communication with job candidates, from less time invested on each candidate to fewer missed interview appointments. However, a recruiter cannot fully enjoy all of the benefits of texting candidates without following certain rules. By adhering to the rules above, you can be assured that you are using SMS messaging the way it should be used in your profession. Joel Lee is an SEO Marketing Specialist at Trumpia, a USA-based SMS marketing company that provides complete SMS solutions, including user-friendly user interface and API for mobile engagement, Smart Targeting, advanced automation, enterprise, and cross-channel features for both mass texting and landline texting use. Trumpia is the top provider of online multi-channel marketing and messaging software services in the USA.